The Red River Star is a Queen Size expansion of the Tarnished Windmill design, originally published in 2015 by the Niemeyer’s. 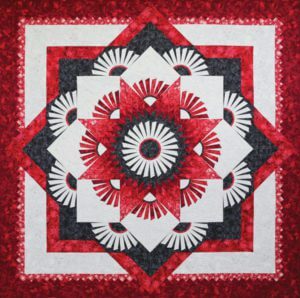 Catherine Erickson, certified instructor, will guide you through the steps to create this beautiful quilt. The pattern incorporates foundation paper piecing and it teaches Quiltworx.com’s latest strip piecing technique for completing lone star units. The quilt has no Y-Seams and finishes at 99”x99”. Kits in the Forever Collection will be available or let our talented staff help you choose a color way to suite your taste. This Cutting Workshop is drop in – will take approximately 1.5 hours.